“UICC is working with over 130 cancer agencies around the world. The Eye Cancer Foundation is pleased to announce our membership as one of those agencies, and to recieve UICC endorsement of the ECF-sponsored Second Eye Cancer Working Day to be held in in Sydney, Australia, on March 24, 2017. Both the ECF and UICC plan to work toward close cooperation on international initiatives in the future,” ECF Chairman Dr. Paul Finger said. Dr. Finger has already contributed to UICC work. He uthored the eye cancer sections of the UICC Manual of Clinical Oncology – 9th edition. Treating eye cancer patients in their 80s, 90s, and even older, present a unique set of physical and ethical challenges. A case report written by Dr. Carina Sanvicente and Dr. Paul Finger, and published in the November issue of EyeNet, demonstrates how successful treatment can improve quality of life even for patients of advanced age. Demographically, America is getting older, and the fastest growing cohort in the country is the “extreme elderly,” that is patients 85 and older. According to agingstats.gov, the “extreme elderly” patient population will rise from 6.2 million in 2014 to 19 million in 2050. Some of the challenges doctors face when treating eye cancer patients over 85 include other chronic illnesses, their mental state, hearing loss, and mobility issues. For older patients with many other health problems, doctors have to weigh the risks and benefits of treatment, and consider carefully how it will impact their overall quality of life. Dr. Neil Bressler, Chief of the Retina Division at the Wilmer Eye Institute in Baltimore, said “no one is too old to benefit from treatment, and patients in their 90s could live another 5 to 10 years.” This may seem counter-intuitive. It’s easy to look at an extremely old patient and think maybe treating eye cancer isn’t the highest priority. After all, they are near the end of their lives. While doctors should certainly consider all of the relevant factors, the case study presented by Drs. Finger and Sanvicente reveals just how beneficial eye cancer treatment can be, even for patients of advanced age. The report focused on Mrs. Gisela Dollinger, a healthy 92-year-old Holocaust survivor who was referred to the New York Eye Cancer Center for treatment of a choroidal melanoma in her left eye. Initially, Dollinger was reluctant to pursue intervention. “I’m 92, I don’t feel anything; how long do you expect me to live?” she asked. When Dr. Finger explained she could live another 10 years with good vision in the treated eye, and that forgoing treatment could lead to metastatic melanoma, she relented. She gave consent to undergo palladium-103 plaque brachytherapy . As Dr. Sanvicente put it, the results surpassed all expectations. Of course, every patient is different. Not every case involving elderly patients will be as easily resolved. Dr. Finger emphasizes that the key is individualizing care. You can download and read the Mrs. Dollinger’s Full Story Here. It makes a difference where you are treated. Knowing the right questions to ask will help you decide. We have developed a list of 7 key questions that will help you evaluate prospective physicians. 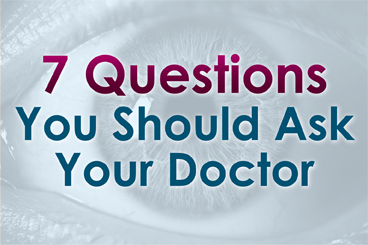 Getting answers to these questions will help you be sure the doctor you chose has the experience necessary to provide the most advanced treatments. The answers will also give insight into where you (the patient) rank within the physician’s list of priorities. When facing the uncertainty that comes with a diagnosis of eye cancer, you want a physician committed to spending all the time necessary to help you understand your condition and concerns. Discussing these 7 questions with your prospective doctors will help you determine their level of commitment. In addition, the answers will give you a peek inside their practice. You will come away with a much better sense of the doctor’s familiarity with the latest diagnostic and treatment options, how the staff views their relationship with their patients, and whether you’re likely to get caught up in bureaucratic red tape. At The New York Eye Cancer Center, we are committed to providing patient centered care. We will happily answer these seven questions, along with any others you may have. Click Here to see the seven questions along with more information on why they are important. A doctor who recently completed fellowship training supported by The Eye Cancer Foundation (ECF) is providing eye cancer treatment in an area of India currently lacking any trained specialists in ocular oncology. Dr. Bikramjit Pal worked under Dr. Tero Kivelä at the Helsinki University Eye Hospital during his six-month fellowship from October 2015 through March 2016. In addition to mentoring from Dr. Kivelä, Dr. Pal learned from a wide range of highly trained medical professionals at the hospital. He actively participated in daily patient workups in the Ocular Oncology Service and observed and assisted in the treatment of eye cancer patients. During his training, Dr. Pal was exposed to a wide range of procedures and treatments, including outpatient and intraoperative transpupillary thermotherapy, ruthenium and iodine plaque brachytherapy, conjunctival surgery, and intravitreal chemotherapy. He was involved in the treatment of conjunctival carcinoma, conjunctival melanoma, ocular adnexal and intraocular lymphoma, uveal melanoma, and retinoblastoma. He also had the opportunity to participate in one-on-one teaching in the latest diagnostic techniques related to eye cancer under the supervision of senior consultants. The Eye Cancer Foundation offers fellowships to doctors from unserved and underserved countries, providing specialized training in the treatment of retinoblastoma and other eye cancers. Once they complete their training, ECF fellows commit to return home to create eye cancer treatment programs. Dr. Pal plans to begin oncology services at a tertiary eye care facility in Kolkata. This center serves a huge population, not only in eastern India, but also in the neighboring countries of Nepal and Bangladesh. Dr. Pal said he was eager to apply his training in his home country. With Dr. Kivelä’s ECF-sponsored fellowship training, Dr. Pal will be able to provide high-quality care to eye cancer patients who would otherwise have little to no access to treatment. This translates to saved vision and lives. Dr. Kivelä will continue to mentor Dr. Pal, providing long-distance consultative support and will soon visit Dr. Pal’s center. Through the recently launched 2020 Campaign, The Eye Cancer Foundation plans to multiply this success story across the world. With your help, we can train 20 eye cancer specialists to work in 20 countries by 2020. Our immediate goal with the 2020 Campaign is to save the lives of 1,000 children by 2020. But that’s only the beginning. Our ability to train doctors and supply them with the equipment they need to properly diagnose and treat retinoblastoma is only limited by the generosity of our donors.